You are here: Home / Health / 10 Healthiest Spices for Cooking and Tips for Using Them! 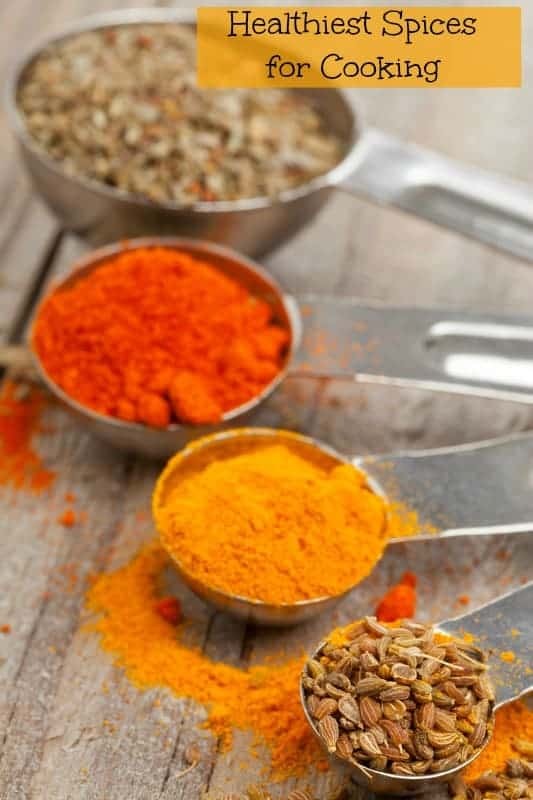 10 Healthiest Spices for Cooking and Tips for Using Them! Making dinner is really a rather simple ‘formula’. Combine protein with vegetables and grains in some particular combination. Throw in the appropriate seasonings and cook. Voila! Dinner is served and you just have to hope that your family likes it. The spices you choose to add to your meal have a huge impact on how it tastes, right? Oregano and basil turn your dinner into an Italian delight but curry and paprika may turn that same dish into something completely different. Changing the spices you use to create your dinner makes it taste different but it can also change how healthy your food is as well. Different spices have different health benefits. Here are some of the healthiest spices you can use as you prepare your food! 1. Cinnamon: Cinnamon is a spice that my whole family enjoys so I am happy that it is on the ‘healthiest spices’ list. It contains iron, calcium and manganese and has shown a lot of promise in controlling blood sugar issues. You can easily put it in your morning oatmeal or add it to your next smoothie. You can also use it on savory dishes that contain sweet potatoes or carrots. 2. Cardamom: I was first introduced to cardamom by an Indian pharmacist that I worked with. I was intrigued by the aroma and she brought some to work for me to take home. It has been used for quite some time in Ayurvedic medicine to help sooth upset stomachs and promote healthy digestion. It has an amazing smell and is what they use in Chai tea to give it it’s characteristic flavor. You can add it to warm milk, tea or hot chocolate to help sooth sore throats since it is a mild antiseptic. Add whole cardamom pods to the water as your rice cooks for a totally new rice experience. It is also easy to add to many baked goods. 3. Cayenne Pepper: We grow a TON of hot peppers every year and my husband and son put them in just about everything. We dehydrate them and make our own hot pepper powder to use all year long. Cayenne pepper boosts circulation and also has pain relieving properties. It has also been suggested that it may help in weight loss. You can add it to all sorts of sauces, dips and casseroles for a bit of healthy heat! 4. Turmeric: I have just discovered turmeric over the last few years. I suffer from chronic pain due to an inflammatory issue and turmeric is supposed to have amazing anti inflammatory properties. 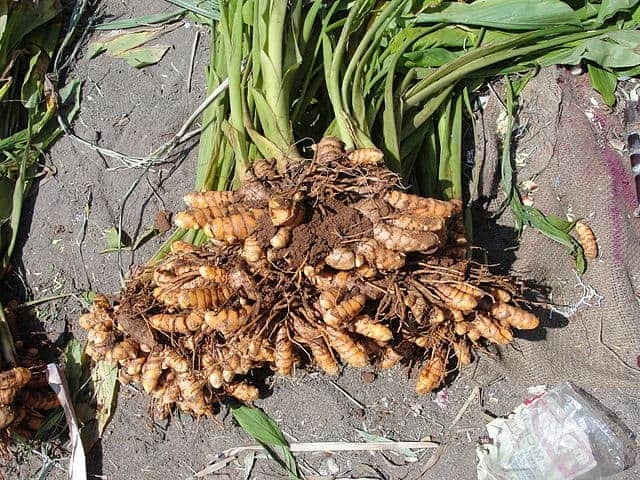 It is a bright orange root and contains the antioxidant curcumin. You can make homemade turmeric tea, put it through the juicer with carrots and apples for a healthy juice, or add it to vegetable dishes. It has a very distinctive taste so while this is one of the healthiest spices to add to your meals, you may need to get used to the flavor! 5. Ginger: Ginger is another spice I use a TON of for therapeutic reasons. Ginger has been used for centuries for the treatment of stomach problems but studies recently have shown that it may help prevent cancer growth. It is easy to add ginger to smoothies, stir-fries, yogurt, tea and many other dishes. I love the crystallized ginger I get at the grocery store…almost candy but much healthier! Try making homemade ginger syrup to use in your tea! 6. Garlic: I have been trying to eat more garlic since it is wonderful for the cardiovascular system and it helps lower cholesterol. I have some circulatory issue so anything good for circulation is high on my list of ‘must have spices’. You can take garlic in capsule form, however the healthiest spices are always better for you in their freshest form. Add it to sauces, marinades, casseroles, and many other dishes. Making ‘garlic tea’ is supposed to be beneficial for colds since it has mild antiviral and antibacterial properties as well. Growing your own garlic is relatively easy if you enjoy gardening! 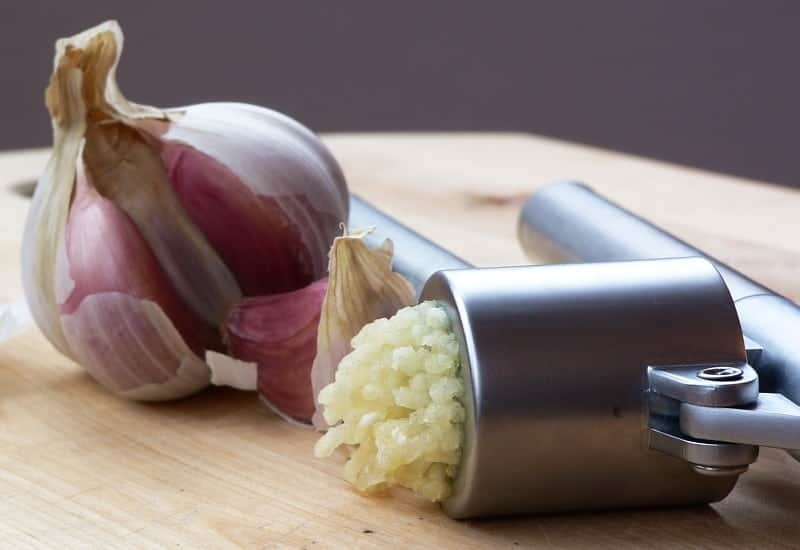 Learn how to roast garlic to take away some of the ‘bite’ and make it a bit milder and sweeter. 7. Saffron: While saffron may be one of the worlds healthiest spices, it is also probably one of the most expensive. If you are familiar with plant parts, saffron is actually the stigma of a very particular species of plant. Those tiny little stalks inside the flower are hand picked which makes them ridiculously expensive. In traditional Persian medicine it has been used as a mood lifter. Often steeped in tea or used as a flavoring for rice. It is supposed to be very beneficial in alleviating PMS symptoms! 8. Anise: I love the flavor of anise but it may not be for everyone. Basically, it tastes very similar to black licorice. I drank tons of it in tea when I was nursing because it has milk boosting properties. It is also beneficial for treating ‘female issues’ in general….great to take the pain and misery out of your period and even supposedly boosts libido. 9. Cumin: This is one spice I don’t use too much of, although I have tried finding ways to incorporate it into our meals more often. It has very powerful anti biotic properties and has shown promise in preventing stomach ulcers. 10. Oregano: I use a ton of oregano and right now it is growing like a weed in my back yard herb garden. It has very strong anti bacterial and anti fungal properties. There are some suggestions that it may help protect from food born illnesses and even oral thrush. Now, technically some of these may be classified as ‘herbs’ rather than ‘spices’ but they are all wonderful flavors to add to your next meal. And please, keep in mind that while herbs and spices have amazing medicinal properties, they should not be used to ‘treat’ a medical condition without discussing it with your personal medical professional! Get more information about healthy spices on Web MD. Do you use some of these healthy spice in your own cooking? Love that so many of my favorite spices are on the list! My grandpa always swore by garlic and onions... I still eat a wide range of foods in the Allium family. Cardamom and Turmeric are two of my favorites as well. Love the color and fragrance when cooking with them. Cinnamon and ginger are definitely my favorites. I love using a variety of different spices.